1회 기록가능한 광기록매체 및 상기 1회 기록가능한 광기록매체상에 관리정보를 기록하는 방법 및 장치를 제공한다. Write-once optical recording medium, and provides a method and apparatus for recording management information on an optical recording medium of the write-once. 상기 기록매체는 적어도 하나 이상의 기록층과 상기 적어도 하나 이상의 기록층상에 SRR 정보를 포함한다. The record medium includes SRR information in at least one recording layer and the at least one recording layer. 상기 SRR 정보는 적어도 하나 이상의 SRR에 연관되고, 헤더부, SRR 엔트리 리스트, 종료표시부를 포함한다. The SRR information are associated to at least one SRR, and a header portion, SRR entry list, the end display portion. 상기 SRR 엔트리 리스트는 복수의 SRR 엔트리들을 포함하며, 각각의 SRR 엔트리들은 하나의 SRR에 연관되며, 세션시작정보를 저장하는 적어도 하나 이상의 상태영역을 포함한다. Wherein the SRR entry list including a plurality of SRR entry, each SRR entry may be associated with a single SRR, it comprises at least one status area to store session start information. 본 발명은 1회 기록가능한 광디스크에 관한 것으로, 특히 1회 기록가능한 광디스크에서 디스크 관리정보(disc management information)를 기록하는 방법 및 장치에 관한 것이다. The present invention relates to a method and apparatus, and more particularly a recording disc management information (disc management information) from the write once optical disc in the optical disc of write once type. 광 기록매체로서 대용량의 데이터를 기록할 수 있는 광 디스크가 널리 사용되고 있다. An optical recording medium is an optical disc that can record a large amount of data, is widely used. 그 중에서도 최근에는 고화질의 비디오 데이터와 고음질의 오디오 데이터를 장시간 동안 기록하여 저장할 수 있는 새로운 고밀도 광기록 매체(HD-DVD), 예를들어 블루레이 디스크(Blu-ray Disc)가 개발되고 있다. In particular, has been recently developed a new high density optical recording medium (HD-DVD) that can be stored for a long period of time by recording the video and audio data of high quality, for example, a Blu-ray Disc (Blu-ray Disc). 차세대 HD-DVD 기술인 블루레이 디스크(Blu-ray Disc)는 기존의 DVD를 현저하게 능가하는 데이터를 저장할 수 있는 차세대 DVD 기술이다. Next-generation HD-DVD technology Blu-ray Disc (Blu-ray Disc) is a next-generation DVD technology that can store data, which significantly exceeds the existing DVD. 최근에는 상기 차세대 DVD를 위한 국제규격을 마련하고 있다. In recent years, it has established an international standard for the next-generation DVD. 차세대 DVD 세계 표준중의 하나인 블루레이 디스크는 650nm 파장의 적색 레이저를 사용하는 현재의 DVD 보다 훨씬 조밀한 405nm의 청자색 레이저를 사용하며, 0.1mm의 광투과층을 가진 두께 1.2mm, 직경 12cm의 디스크에 현재의 DVD 보다 월등 한 양의 데이터를 저장할 수 있다. Next-generation DVD, one of the Blu-ray Disc standard in the world uses a blue-violet laser of 405nm which is much denser than the present DVD that uses a red laser of 650nm wavelength, a thickness of 0.1mm with a light transmission layer of 1.2mm, diameter 12cm can store the amount of data was superior to the current DVD disk. 블루레이 디스크에 관련된 표준안이 마련되고 있으며, 재기록 가능한 블루레이 디스크(BD-RE)에 이어서 1회 기록가능한 블루레이 디스크(BD-WO)에 대한 각종 표준안이 마련되고 있다. Blu-ray and the standard associated with the disk is provided, followed by a rewritable Blu-ray disc (BD-RE) There are various standards are provided for a write-once Blu-ray disc (BD-WO). 특히, 1회 기록가능한 블루레이 디스크(BD-WO)의 표준안중에는 디스크의 관리정보를 기록하는 방법이 논의되고 있으며, 이러한 관리정보에는 1회 기록가능한 광디스크로서의 특징을 나타내는 것으로서 디스크 기록상태 정보를 기록하는 방법이 포함되어 있다. In particular, the write-once Blu-ray disc (BD-WO) standard, while there is a method for recording management information of the disk is discussed in, this management information, recording the disc recording status information, as referring to the characteristics as an optical disc of write once type the method includes. 상기 디스크 기록상태 정보란, 1회 기록가능한 광디스크에서 호스트(Host)나 사용자(User)가 기록가능한 영역을 쉽게 찾을 수 있도록 하는 것으로 일종의 현재 디스크내의 사용상태를 표시하는 정보라 할 것이다. The disc recording status information is, is it the information indicating the use state in the kind of current disc that allows an optical disc of write once you find the host (Host) or user (User) is a recordable area. 기존의 1회 기록가능한 광디스크(예를들어, CD 또는 DVD)에서는 상기 기록상태를 알려주는 정보를 다양한 명칭으로 사용하였는 바, 예를들어, CD계열에서는 트랙정보(Track Information), DVD계열에서는 알존 (RZone), 또는 프래그먼트(Fragment)등으로 표현하기도 하였다. Existing write-once optical disc (e.g., CD or DVD) in the bar hayeotneun using the information indicating the recording status in a variety of names, for example, in the CD family in the track information (Track Information), DVD series aljon It was also expressed as (RZone), or fragment (fragment) and the like. 도1은 기존의 1회 기록가능한 광디스크에서(예를들어, DVD-R)의 기록상태 정보를 도시한 것이다. Figure 1 (for example, DVD-R) on an optical disc recording existing one shows a recording state of the information. 도1에 도시된 바와 같이, 디스크의 관리정보는 RMD(Recording Management Data)영역내에 기록하여 관리된다. 1, the management information on the disc is managed in the recording (Recording Management Data) RMD area. 특히 디스크의 기록상태를 표시하는 정보는 상기 RMD영역중 RMD 필드(field) 4~12 를 사용하여 관리되어 진다. In particular, information indicating the recording status of the disc is managed using RMD fields (field) 4 ~ 12 of the RMD area. 또한, 디스크의 기록상태를 표시하는 정보로서 "알존(RZone)"이라는 명칭을 사용하고 있으며, 이러한 알존(RZone)의 종류에는 추가기록이 가능한 오픈알존 (open RZone) 및 인비지블알존 (Invisible RZone)과, 추가기록이 불가능한 클로즈알존(close RZone)이 있다. In addition, "aljon (RZone)" are using that name, this aljon (RZone) type, the available open aljon (open RZone) and inbiji block aljon (Invisible RZone) additional records as the information indicating the recording status of the disc and, a closed aljon (close RZone) that can not be additionally recorded. 상기 알존(RZone)정보는, 호스트등에서 디스크에 추가기록을 위하여 추가 기록가능한 위치를 요구할 경우에, 드라이브에서는 첫번째 오픈알존(open RZone) 및 두번째 오픈알존(open RZone)의 LRA를 확인하여 일반적으로는 "LRA+1"이 되는 위치를 추가기록가능한 위치로 호스트등에 전송하게 된다. The aljon (RZone) information, if it requires a location possible additional recording for additional recording on a disc, etc. the host, the drive to check the LRA of the first open aljon (open RZone) and a second open aljon (open RZone) generally where the "LRA + 1" as the recordable location and transmits the host or the like. 상기 "추가기록가능한 위치"를 NWA(Next Writable Address)라고 하고, 전송된 NWA정보로부터 호스트등은 유효하게 디스크에 추가기록등이 가능하게 된다. Such as the "recordable position" the NWA (Next Writable Address) that is, the host from the transmitted NWA information and the like is effectively added to the recorded disk is enabled. 그러나, 상기 전술한 DVD-R 디스크는, 1회 기록가능한 블루레이 디스크(BD-WO)와는 그 물리적구조 및 사용환경이 상이함에 따라 상기의 종래방식을 그대로 1회 기록가능한 블루레이 디스크에 적용할 수 없게 된다. However, the above-described DVD-R discs, write-once Blu-ray disc (BD-WO) than their physical structure and use environment are different as along to apply the conventional method of the same in the write-once Blu-ray disc It can be eliminated. 특히 1회 기록가능한 블루레이 디스크(BD-WO)의 경우는 드라이브 자체에서 디스크의 결함을 관리함에 따라, 디스크내에 결함관리를 위한 특별한 영역이 추가로 필요하게 된다. Particularly in the case of write-once Blu-ray disc (BD-WO) according to managing defects on the disc drive itself, it is necessary to add a special area for defect management within a disc. 즉, 상기 BD-WO는 복잡한 디스크 구조를 가지고 있어, 결국 종래 DVD-R 방식에 적용된 디스크 기록상태 정보를 그대로 적용할 수 없게 된다. That is, the BD-WO has got a complex disc structure, it is not after all be applied as the disc recording status information is applied to the conventional DVD-R system. 따라서 고밀도 광디스크에서 디스크의 사용상태에 대응하는 효율적인 관리정보의 기록방법이 절실히 요구된다 할 것이며, 특히 이는 규격화된 정보로서 제공되어야 상호간의 호환성을 확보할 수 있다 할것이다. Therefore, a recording method will be effective in the management information corresponding to the use state of the disc from a high density optical disc are urgently needed, especially halgeotyida which it is possible to ensure the compatibility of each other should be provided as standardized information. 또한 상기와 같은 블루레이 디스크(BD-WO)의 경우가 아니더라도 결함관리가 수행되는 1회 기록가능한 고밀도 광디스크에서 적용가능한 새로운 디스크 관리정보의 기록방법에 대한 필요성이 요구 되고 있다. There is also a need and demand for a recording method of a Blu-ray disc (BD-WO), if not the defect management is write-once high density optical disc in the new disc management information applicable to the case of being performed as described above. 본 발명은 상기 종래기술의 제한 및 불합리한 면에 기인하는 많은 문제점을 실질적으로 해결하기 위한, 1회 기록가능한 광디스크 및 광디스크에 관리정보를 기록하는 방법 및 장치에 관한 것이다. The present invention relates to a method and apparatus for recording management information on the limits of conventional technology and the optical disc and an optical disc write once, to substantially solve the many problems due to the irrational side. 본 발명의 목적은, 1회 기록가능한 광디스크의 관리정보를 기록하는 방법 및 장치를 제공하고자 하며, 특히 상기 관리정보로서 디스크 사용 상태정보(used status of the disc)를 효율적으로 기록관리하는 방법을 제공하는 데 있다. An object of the present invention is provide a method for administration once, and to provide a method and apparatus for recording management information in a recordable optical disc, in particular efficiently record the disc use state information (used status of the disc), as the management information, there used to. 또한, 본 발명의 또다른 목적은, 1회 기록가능한 광디스크에서 트랙정보(track information)를 기록하는 방법 및 장치를 제공하고자 하며, 상기 트랙정보(track information)는 디스크 사용 상태정보(used status of the disc)로서 기록되어 진다. Further, another object of the present invention, and to provide a method and apparatus for recording track information (track information) on an optical disc of write once type, the track information (track information) is disc use state information (used status of the is recorded as the disc). 본 발명의 방법 및 장치는 결함관리를 수행하는 1회 기록가능한 광디스크에도 적용가능하다. The method and apparatus of the present invention is also applicable to an optical disc of write once to perform the defect management. 또한, 본 발명의 또다른 목적은, 1회 기록가능한 광디스크에서 트랙정보(track information)를 기록하는 방법 및 장치를 제공하고자 하며, 또한 디스크내에 물리적인 추가영역의 할당없이 세션정보(session information)를 기록하고, 이로부터 기존의 재생전용 규격과의 호환성을 유지하는 방법을 제공하고자 한다. Further, another object of the present invention, and to provide a method and apparatus for recording track information (track information) on an optical disc of write once type, and the session information (session information) without assignment of physical additional area within the disc records, and to provide a method for maintaining compatibility with the existing reproduction-only standard therefrom. 또한, 본 발명의 또다른 목적은, 트랙정보(track information)의 효율적인 업데이트 방법을 제공하고자 한다. Further, another object of the present invention to provide a method of efficiently updating track information (track information). 본 발명에 의한 기록매체는, 적어도 하나 이상의 기록층을 구비한 기록매체에 있어서, 적어도 하나 이상의 기록단위를 포함하는 세션과, 적어도 하나 이상의 기록층상에 상기 적어도 하나 이상의 기록단위에 관련된 연속기록 정보를 구비하되, 상기 연속기록 정보는 적어도 하나 이상의 기록단위 엔트리를 포함하는 기록단위 리스트를 포함하고, 상기 적어도 하나 이상의 기록단위 엔트리는 적어도 하나 이상의 기록단위 각각에 관련되고, 해당 기록단위가 세션의 시작인지를 표시하는 세션시작정보를 저장하기 위한 적어도 하나 이상의 상태영역을 포함하는 것을 특징으로 한다. The recording medium according to the present invention, in the at least one record having at least one recording layer medium, the continuous recording information relating to the session, and at least one recording layer, at least one recording unit of the the including at least one recording unit but having, whether the sequential recording information is at least one recording unit of the entry and wherein the at least one recording unit entry for the recording unit list including being associated to each of the at least one recording unit, and the recording unit to start the session, a characterized in that it comprises at least one status area to store session start information indicating. 본 발명에 의한 또다른 기록매체는, 적어도 하나 이상의 기록층과, 적어도 하나 이상의 기록층상에 적어도 하나 이상의 SRR 엔트리가 저장되어 있고, 각각의 SRR 엔트리는 세션시작정보를 저장하는 적어도 하나 이상의 상태영역을 포함하고, 상기 상태영역은 해당 SRR엔트리내의 시작비트들(beginning bits)을 제외한 영역에 구비되는 것을 특징으로 한다. Another recording medium according to the present invention, at least one recording layer, and the at least one SRR entry on the at least one recording layer stores, each SRR entry, the at least one status area to store session start information, and wherein the status area is characterized in that provided in the region except for the start bit in the corresponding SRR entry (beginning bits). 본 발명에 의한 기록매체상의 관리정보 기록방법은, 적어도 하나 이상의 기록층을 구비한 기록매체상에 관리정보를 기록하는 방법에 있어서, (a) 적어도 하나 이상의 기록층상에 연속기록 정보를 기록하되, 상기 연속기록 정보는 적어도 하나 이상의 기록단위 엔트리를 포함하는 기록단위 리스트를 포함하고, 상기 적어도 하나 이상의 기록단위 엔트리는 적어도 하나 이상의 기록단위 각각에 관련되며, 상기 적어도 하나 이상의 기록단위는 세션을 형성하고, 상기 적어도 하나 이상의 기록단위 엔트리는 해당 기록단위가 세션의 시작인지를 표시하는 세션시작정보를 저장하기 위한 적어도 하나 이상의 상태영역을 포함하는 것을 특징으로 한다. A management information recording method on the recording medium according to the invention is characterized in that in at least a method of recording management information on a recording medium having at least one recording layer, (a), but records the sequential recording information on the at least one recording layer, the continuous recorded information, and wherein the at least one recording unit entry includes a recording unit list including at least one recording unit entry is associated with a respective at least one recording unit, wherein the at least one recording unit forms a session the at least one recording unit entry is characterized by that the recording unit comprises at least one status area to store session start information indicating whether the start of a session. 본 발명에 의한 기록매체상의 또다른 관리정보 기록방법은, 적어도 하나 이상의 기록층을 구비한 기록매체상에 관리정보를 기록하는 방법에 있어서, (a) 적어도 하나 이상의 기록층상에 적어도 하나 이상의 SRR 엔트리를 기록하되, 각각의 SRR 엔트리는 세션시작정보를 저장하는 적어도 하나 이상의 상태영역을 포함하고, 상기 상태영역은 해당 SRR엔트리내의 시작비트들(beginning bits)을 제외한 영역에 구비되는 것을 특징으로 한다. Another management information recording method on the recording medium according to the invention is characterized in that in at least a method of recording management information on a recording medium having at least one recording layer, (a) at least one SRR entry on the at least one recording layer each SRR entry, but record comprises at least one status area, and the status area to store session start information is characterized in that provided in the region except for the start bit in the corresponding SRR entry (beginning bits). 본 발명에 의한 기록매체상의 관리정보 기록장치는, 적어도 하나 이상의 기록층을 구비한 기록매체상에 관리정보를 기록하는 장치에 있어서, 적어도 하나 이상의 기록층상에 연속기록 정보를 기록하기 위한 기록재생부(recording/reproducing part)를 포함하되, 상기 연속기록 정보는 적어도 하나 이상의 기록단위에 연관되어, 헤더부, 기록단위 엔트리 리스트, 종료표시부를 포함하고, 상기 기록단위 엔트리 리스트는 복수의 기록단위 엔트리들을 포함하되, 각각의 기록단위 엔트리들은 하나의 기록단위에 연관되며, 세션시작정보를 저장하기 위한 적어도 하나 이상의 상태영역을 포함하는 것을 특징으로 한다. A management information recording unit on the recording medium according to the present invention, in at least the device for recording the management information on a recording medium having at least one recording layer, the unit recording and reproducing for recording a sequential recording information on the at least one recording layer comprising the (recording / reproducing part), of the continuous recorded information unit at least in conjunction with one or more recording unit, a header portion, the recording entry list, end a display unit, and the recording unit entry list has a plurality of recording unit entry comprising, each recording unit is associated entries in the one recording unit, it characterized in that it comprises at least one status area to store session start information. 본 발명의 추가적인 특징 및 장점은 후술할 발명의 상세한 설명에 의해 개시될 것이며, 상기 본 발명의 목적 및 추가적인 장점들은 도시한 도면 뿐만 아니라, 발명의 상세한 설명과 청구범위에 의해 구체화되고 달성가능한 구조가 될 것이다. Will be initiated by the Detailed Description of the Invention Additional features and advantages of the invention will be described later, the objective and additional advantages of the present invention are possible, as well as a view showing, it is embodied by the description and the claims of the invention achieve the structure It will be. 상기 본 발명에 대해 전술한 내용과 후술할 상세한 설명은 본 발명을 설명하기 위한 하나의 전형적이고, 예시적인 예로서 이해되어야 할 것이다. The above description for the present invention and the following detailed description and is one of selection for the purpose of illustrating the invention, it is to be understood as illustrative examples. 본 발명의 추가적인 목적 및 장점은 후술할 상세한 설명과 관련된 도면으로부터 더욱 명확해 질 것이다. Further objects and advantages of the invention can be more fully understood from the figures relating to the following detailed description. 도면의 구성은 다음과 같다. Configuration of the figure is as follows. 도1은 종래 1회 기록가능한 광디스크(DVD-R)의 구조를 도시한 것이다. Figure 1 shows a structure of a conventional write-once optical disc (DVD-R). 도2는 본 발명이 적용되는 1회 기록 가능한 광디스크의 트랙종류에 대해 예를들어 도시한 것이다. Figure 2 for example, shown for a track of an optical disc of write once type to which the present invention is applied. 도3은 본 발명의 1회 기록가능한 광디스크의 전체구조 및 본 발명의 실시예에 따른 디스크 관리정보를 기록하는 방법을 도시한 것이다. Figure 3 illustrates a method for recording disc management information according to an embodiment of the whole structure, and the present invention of an optical disc of write once type according to the present invention. 도4는 본 발명의 제1 실시예에 따른, 도3의 1회 기록가능한 광디스크에서 트랙정보를 기록하는 방법을 도시한 것이다. Figure 4 illustrates a method for recording track information in the first embodiment, an optical disc of write once type of FIG. 3 according to the present invention. 도5는 본 발명의 제2 실시예에 따른, 도3의 1회 기록가능한 광디스크에서 트랙정보를 기록하는 방법을 도시한 것이다. Figure 5 illustrates a method for recording track information in the second embodiment, an optical disc of write once type of FIG. 3 according to an embodiment of the present invention. 도6은 본 발명의 제3 실시예에 따른, 도3의 1회 기록가능한 광디스크에서 트랙정보를 기록하는 방법을 도시한 것이다. 6 illustrates a method for recording track information, in the third embodiment, an optical disc of write once type of FIG. 3 according to the present invention. 도7은 본 발명의 1회 기록가능한 광디스크의 트랙정보를 업데이트하는 방법을 도시화 것이다. 7 is a urbanization a method of updating the track information of the optical disc of write once type according to the present invention. 도8은 본 발명의 1회 기록가능한 광디스크의 기록재생장치를 도시한 것이다. Figure 8 illustrates a recording and reproducing apparatus of an optical disc of write once type according to the present invention. 이하 본 발명에 따른 1회 기록 가능한 광디스크의 관리정보 복원방법에 대한 바람직한 실시예를 첨부된 도면을 참조하여 상세히 설명하고자 한다. With reference to the accompanying drawings, a preferred embodiment of a one-time management information of a recordable optical disk restoration method according to the present invention will be described in detail. 설명의 편의상 1회 기록가능한 블루레이 디스크(BD-WO)의 경우를 예로하여 설명하고자 한다. It will be described in the description for convenience once a case of a recordable Blu-ray disc (BD-WO) in the Examples. 아울러, 본 발명에서 사용되는 용어는 가능한한 현재 널리 사용되는 일반적인 용어를 선택하였으며, 따라서 본 발명은 단순한 용어의 명칭이 아닌 출원인에 의해 정의된 용어가 가지는 의미로서 본 발명을 파악하여야 됨을 밝혀두고자 한다. In addition, terms used in the present invention was selected a general term that is used currently available widely, and therefore the present invention is a means having the terms defined by the applicant instead of the name of the simple terms want to place found that shall identify the invention do. 관련하여 본 발명에서 '트랙(track)'의 의미는 BD-WO와 같은 1회 기록가능한 광디스크에서 연속기록영역(SRR: Sequential Recording Range)을 의미하는 것으로, 즉 디스크상의 데이터 또는 정보를 기록하는 영역을 의미한다. Related to the meaning of "track (track)" in the present invention, continuous recording area in the write once optical disc such as a BD-WO: to mean (SRR Sequential Recording Range), that is the area for recording data or information on the disc It means. 따라서, 본 발명에서는 이하 기록단위를 의미하는 용어로서 "트랙(track)" 또는 "SRR"을 동일의미로 사용할 것이다. Therefore, the present invention will use a "track (track)" or "SRR" in the same sense as the term used to denote the following recording unit. 또한, 본 발명에서 "트랙정보(track-info)" 또는 "SRRI(SRR Information)"는 1회 기록가능한 광디스크의 사용상태를 표시하기 위한 정보를 통칭하여 적용하는 용어이다. Further, the "information track (track-info)" or "(SRR Information) SRRI" in the present invention is a term used to collectively apply the information for displaying the state of use of an optical disc of write-once. 또한, "세션(session)"은 상기 트랙(또는 SRR)이 적어도 하나이상으로 구성된 단위를 의미하고, "세션(session)정보"는 상기 세션에 관련된 정보를 의미한다. In addition, the "session (session)" refers to the unit of the said track (or SRR) consisting of at least one or more, and a "session (session) information" means the information related to the session. 본 발명은 새로운 고밀도 광디스크에 적용가능한 트랙정보를 기록하는 방법 및 장치를 제공하고자 한다. The present invention is to provide a method and apparatus for recording track information applicable to a new high density optical disc possible. 관련하여, 본 발명은 세션정보를 별도의 물리적 영역을 할당하지 않고 트랙정보내에 기록하고자 하며, 아울러 본 발명은 사용가능한 오픈 트랙의 갯수를 제한하지 않거나 또는 최대 16개의 오픈 트랙을 사용하는 경우에 대해 적용된다. Regard, the invention is to be written in the track information without allocating an additional physical area of ​​the session information, as well as the invention for the case that use does not limit the number of an open track on or up to 16 open track It shall apply. 따라서, 2개의 오픈 트랙만을 활용하는 종래기술(예를들어, DVD-R의 알존(RZone)의 경우)과 비교시, 본 발명은 디스크를 더욱 효율적으로 사용하는 것이 가능해지고 이를위해 상기 디스크 관리정보로서 트랙정보의 최적구조를 제공하고자 한다. Thus, the prior art utilizing only two open tracks (for example, for the aljon (RZone) of the DVD-R) as compared to the present invention is the disc management information for them to use the disc more efficiently becomes possible as intended to provide an optimum structure of the track information. 도2는 본 발명이 적용되는 1회 기록가능한 광디스크상의 트랙종류를 도시한 것이다. 2 shows a track on the optical disc of write once type to which the present invention is applied. 도시된 바와같이, 디스크는 복수의 트랙으로 구분되어 진다. As shown, the disc is divided into a plurality of tracks. 예를들어, 트랙 #1,#2는 트랙내에 추가기록 가능한 영역이 남아있는 오픈트랙 (open track)에 해당되고, 트랙 #3,#4는 트랙이 완전히 기록되어 추가기록이 불가능한 클로즈트랙 (close track or complete track)이 되며, 트랙 #5는 마지막 트랙으로 항상 추가기록이 가능한 트랙으로 인터미디에이터 트랙 (intermediate track) 이 된다. For example, the track # 1, # 2 are available for the open track (open track) remains is a recordable region in the track, the track # 3, and # 4 is not possible to add the track is completely written record closed track (close the track or complete track) is, track # 5 is a track that can always be added to the recorded track, the last track inter-mediator (intermediate track). 관련하여, 추기기록이 불가능한 트랙(클로즈트랙, 트랙#3,#4)중, 트랙#3은 마지막으로 데이터가 기록된 영역으로부터는 추가기록가능한 상태였으나(오픈트랙), 특정원인에 의해(주로 호스트의 close명령) 트랙의 나머지부분이 'zero padding'된후(빗금친부분) 클로즈트랙으로 변경된 경우이다. Regard, the additional recording of the record that can not track (closed tracks, Tracks # 3 and # 4), the track # 3 is finally from the data recording area is yeoteuna recordable state (an open track), by a certain cause (mainly close command from the host), the remainder of the track doenhu 'zero padding' (hatched portion) is changed in such case closed track. 또한, 트랙 #4는 클로즈트랙으로서, 전체 영역이 기록완료되고, 따라서, 클로즈(close)명령에 따라 클로즈트랙(close track)으로 변경시 'zero padding'없이 본 발명의 트랙종류정보(track type)만을 변경하게 된다. In addition, the track # 4 is a closed track, the entire area is completed and recorded, and therefore, close (close) according to a command-closed track (close track) track type information (track type) of the present invention without the 'zero padding' when changes to only it is changed. 또한, 각 트랙은 해당 트랙의 "첫번째 어드레스를 알려주는 정보 (start PSN of track)"와 트랙의 종류에 상관없이 항상 "데이터가 기록된 마지막 아드레스 정보 (LRA: Last Recorded Address)"를 가진다. Each track is always "the data is recorded last ah dress information (LRA: Last Recorded Address)" regardless of the type of "information (start PSN of track) indicating the first address" of the track and the track has. 상기 PSN(Physical Sector Number)은 디스크내 특정위치의 위치정보를 알려주는 일반적인 용어이며, 또한 LRA는 실제로 데이터가 기록된 마지막 어드레스를 의미한다. The PSN (Physical Sector Number) is the location information is a general term indicating the location of a particular disc, and LRA means the last address of the data is actually recorded. 따라서, 트랙 #3의 경우 'zero padding'되기 이전의 위치가 LRA가 된다(LRA3). Accordingly, in the case of Track # 3 is the prior 'zero padding' position is the LRA (LRA3). 구체적으로는 기록단위가 클러스터(cluster)인 경우 1클러스터내에는 총32개의 섹터들이 존재하며, 만약 1클러스터내 에서 일정부분 섹터만큼만 기록되고 나머지 섹터들은 'zero padding'하였다면, 이경우 LRA값은 'zero padding'되기 이전의 마지막 섹터 어드레스가 된다. Specifically, is present in a total of 32 sectors, if the first cluster within a portion sectors as much as is recorded on the remaining sectors If 'zero padding', In this case, LRA value 'zero within a cluster when the recording unit is a cluster (cluster) 'it is the last sector address before the padding is. 또한 LRA로부터 구해지는 NWA(Next Writable Address)는 호스트등의 요청에 의해 추가기록 가능한 오픈트랙(트랙 #1,#2) 및 인터미디에이터 트랙(트랙 #5)에서만 결정되어 전송되고, 클로즈트랙(트랙 #3,4)에서는 추가기록이 불가능하므로 NWA가 존재하지 않는다. In addition, NWA (Next Writable Address) obtained from the LRA is transferred is determined only on the write once read many open track (Track # 1, # 2) and inter-mediator track (Track # 5) by a request of a host, closed track (Track # 3,4), the NWA does not exist because it can not be added to the record. 본 발명은 도2에 도시된 바와같은 다양한 트랙의 종류와 상기 트랙들과 관련된 세션정보를 지정하는 방법을 제공하고자 하며, 이하 도3~도6을 참조하여 상세히 설명하면 다음과 같다. The invention will be described in detail with reference to the, and to provide a method for specifying the session information related to the type and the track of the various tracks, more than 3 to 6 as shown in Fig. 2 as it follows. 도3은 본 발명이 적용되는 1회 기록가능한 광디스크의 구조 및 본 발명의 실시예에 따라 관리정보를 기록하는 방법을 도시한 것으로, 도3의 1회 기록가능한 광디스크는 하나의 기록층을 가진 싱글레이어(single layer) 디스크에 관한 것이다. 3 is that of a method for recording management information according to an embodiment of the structure and the present invention of an optical disc of write once type to which the present invention is applied, an optical disc of write once type of FIG. 3 is a single that has a single recording layer layer (single layer) relates to a disk. 단, 본 발명은 상기 디스크 구조에 한정되지 않으며 본 발명의 방법은 듀얼에이어(dual layer)와 같은 멀티레이어(multi layer)에도 동일하게 적용가능하다. However, the present invention is equally applicable to multi-layer (multi layer), such as the method of the present invention is not limited to the disk structure is followed by a dual (dual layer). 도3에 도시된 바와같이, 상기 디스크는 리드인 영역, 데이터 영역 및 리드아웃 영역을 포함하고 있다. As shown in Figure 3, the disc includes a lead-in area, data area and lead-out area. 데이터영역내에는 결함영역을 대체하기 위해 이너스페어영역(ISA0) 및/또는 아우터스페어영역(OSA0)이 구비되어 있고, 상기 리드인영역과 리드아웃영역은 복수의 결함관리 영역(DMA1 ~ DMA4)을 구비하고 있다. In the data area is the inner spare area (ISA0) and / or an outer spare area, and (OSA0) is provided, the lead-in and lead-out areas includes a plurality of defect management areas (DMA1 ~ DMA4) to replace a defective area and a. 리드인영역내에는 제1 임시 결함관리 영역(TDMA 1)이 구비되고, 아우터 스페어영역(OSA0)내에는 제2 임시 결함관리 영역(TDMA 2)이 구비된다. In the lead-in area is provided with a first temporary defect management area (TDMA 1), in the outer spare area (OSA0) it is equipped with a second temporary defect management area (TDMA 2). 상기 TDMA들은 결함관리 정보를 일시적으로 저장하게 되며, 반면 상기 DMA들은 결함관리 정보를 영구히 저장하게 된다. The TDMA may be temporarily stored in the defect management information, while the DMA are the permanently stored defect management information. 또한 데이터를 더 이상 기록하지 않거나 디스크를 파이널라이즈(finalize)하는 경우에는, 상기 TDMA내에 저장된 정보를 적어도 하나의 DMA로 이전 기록하게 된다. In addition, if the finalizing (finalize) for the disk does not record the data any more, the information stored in the TDMA is transferred and recorded in at least one DMA. 일반적으로 각 DMA는 동일한 정보를 저장하게 되며, 따라서, 만약 하나의 DMA에 에러나 손실이 발생하더라도, DMA에 기록된 중요 관리정보는 또다른 DMA를 통해 복구가능하므로 손실되지 않게 된다. Generally, each DMA stores the same information as is, and therefore, even if the one of the DMA error or loss occurs, the important management information recorded in the DMA can no longer be lost because recoverable through another DMA. 일반적으로 재기록가능한 광디스크의 경우에는 한정된 크기의 결함관리영역(DMA)만 구비해도 해당 영역에 쓰고 지움을 반복할 수 있기에 많은 크기의 DMA가 필요치 않다. In the case of a general rewritable optical disc it has to be provided with only a defect management area (DMA) of a limited size because it can be written in the area repeatedly wipe is not required the size of many DMA. 그러나, 1회 기록가능한 광디스크의 경우에는 한번 기록된 영역은 다시 기록을 위해 사용할 수 없으므로 결함관리를 위해서는 더 큰 크기의 관리영역이 필요하게 된다. However, in the case of write-once optical disc has not be used for the recording area is recorded once again becomes more necessary administrative area of ​​the large size to the defect management. 상기 TDMA1은 리드인영역에 고정된 크기로 할당되며, 상기 TDMA2는 아우터스페어영역(OSA0)내에 스페어영역(OSA0)의 크기와 연동된 크기로 할당된다. The TDMA1 is allocated with a fixed size in the lead-in area and the TDMA2 is allocated within the outer spare area (OSA0) in a size interworking with the size of the spare area (OSA0). 예를들어, OSA0의 크기가 N*256클러스터 라고 하면, TDMA2의 크기 P= (N*256)/4 클러스터로 할당된다. For example, if the size of the OSA0 as N * 256 clusters are allocated to a size of P = (N * 256) of the TDMA2 / 4 clusters. 또한, 각각의 TDMA내에는, 임시 결함영역(TDFL: Temporary Defect List )정보와 임시 디스크 정의구조(TDDS: Temporary Disc Definition Structure)정보가 하나의 기록단위(BD-WO의 경우 1클러스터)내에 기록되어 진다. Further, in each of the TDMA is the temporary defective area is recorded in the:: (Temporary Disc Definition Structure TDDS) information is one (1 cluster when the BD-WO) recording unit (TDFL Temporary Defect List) information and temporary disc definition structure It is. 또한, 각각의 TDMA내에는 디스크 트랙정보(Track-Info)와 임시 디스크정의구조(TDDS)정보가 또다른 기록단위로 기록되어 진다. 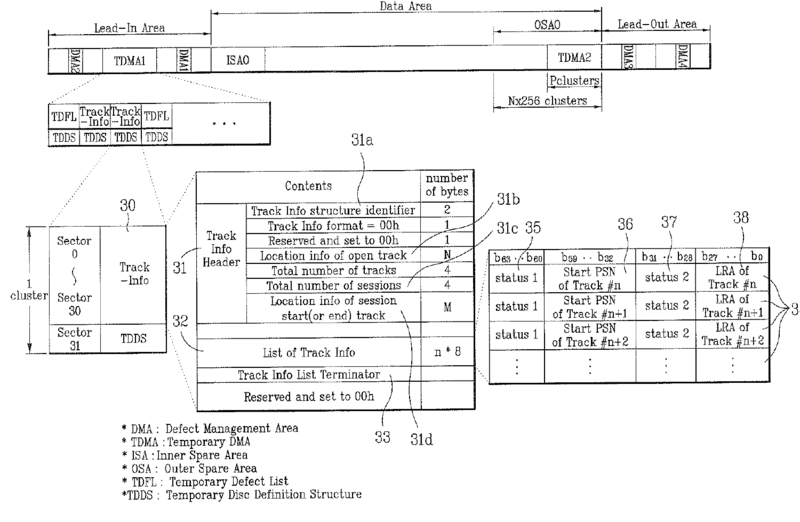 Further, in each of the TDMA is recorded it is the disc track information (Track-Info) and the temporary disc definition structure (TDDS) information into another recording unit. 관련하여, 데이터영역내에 결함영역이 발생되면 이를 스페어영역으로 대체하 는 과정이 수행되고, 이러한 일련의 과정에 관련된 관리정보를 결함영역리스트(TDFL)로서 저장하게 된다. Regard, if the defective area occurs in the data area is replaced with the process of this, the spare area is performed, and stores management information relating to these processes as a defective area list (TDFL). 싱글레이어 디스크의 경우, 결함 리스트의 크기에 따라 1 ~ 3 클러스터의 크기로 TDFL을 작성한다. For a single-layer disc, the TDFL is created as a size of 1-3 clusters according to the size of the defect list. 트랙정보는 디스크내 특정영역의 기록 또는 미기록 여부를 알려주는 디스크 상태정보로서 특히, 디스크가 연속기록(Sequential or incremental recording) 방식일때에 적용된다. Track information is applied in particular, the disc is a continuous recording (Sequential or incremental recording) method as the disc state information indicating a recording or non-recorded whether or not a particular region when the disk. 또한 도3에 도시한 바와같이, TDMA의 1클러스터는 섹터0~섹터30 에 기록된 트랙정보와 섹터31에 기록된 TDDS정보로 구성된다. In addition, as shown in Figure 3, one cluster of the TDMA is composed of the TDDS information recorded in the information tracks 31 recorded in the sector with the sector 0 to sector 30. 단, TDDS를 섹터0에 기록하고, 트랙정보를 나머지 섹터(즉, 섹터1~섹터31)에 기록하는 것도 가능하다. However, recording a TDDS in sector 0, and the other sector (i.e., sector 1 to sector 31), the track information can also be written to. 도3을 참조하여 트랙정보(30)에 대해 상세히 설명하면 다음과 같다. Reference to Figure 3 will be described in detail for the track information 30 as follows. 먼저, 트랙정보는 크게 3가지부분으로 구성되어 있으며, 이는 트랙정보임을 인식가능하게 하는 헤더부(Header, 31)와, 트랙정보를 직접표시하는 트랙정보 리스트부 (List of Track Info, 32)와, 트랙정보의 종료를 알려주는 종료표시부(Track Info List terminator, 33) 로 구성되어 있다. First, consists track information is largely of three parts, which section header which enables to recognize that the track information (Header, 31), a track information list portion indicating the track information directly (List of Track Info, 32) and , it consists of the end display portion (track info List terminator, 33) indicating the termination of the track information. 헤더부(31)는 트랙정보(30)내의 선두에 위치하며, 트랙정보임을 인식가능하게 하는 "Track Info Structure identifier"필드(31a)와, 해당 트랙정보내에 존재하는 오픈트랙의 위치를 알려주는 "location info of open track"필드(31b)와, 전체 세션의 갯수를 알려주는 "Total number of session"필드(31c)와, 세션의 시작트랙 또는 종료트랙의 위치를 알려주는 "location info of session start (or end) track"필드(31d)를 포함하고 있다. Header unit 31 to inform the the "Track Info Structure identifier" field (31a) located at the head of a track information 30, which enables to recognize that the track information, the position of the open tracks existing within the corresponding track information " location info of open track "is indicative of a location of the field (31c) and the start track or end of the session, track" location info of session start "field (31b), and indicating the number of the whole session is" total number of session ( or end) includes the track "field (31d). 따라서 직접적인 트랙정보리스트를 읽기 이전에 전체적인 트랙정보의 내용을 확인할 수 있게 된다. Therefore, before reading the track information list it is directly able to view the contents of the overall track information. 또한 헤더부(31)에는 상기 필드들외에도 필요한 정보들을 새로이 정의하여 구격화하는 것도 가능하다. In addition, the header portion 31, it is possible to obtain intense to newly define various information in addition to the above fields. 헤더부 다음에는 트랙정보 리스트부(32)를 기록하고, 트랙정보 리스트가 끝나면 트랙종료표시부(32)로서 트랙정보의 종료를 표시하게 된다. Header portion is followed by a track information list is recorded portion 32, and the end of the track information list display the termination of the track information a track ends the display unit 32. 특히 트랙종료표시부(33)는 상기 트랙정보가 가변적인 크기를 가지는 경우에 해당 트랙정보의 종료지점을 알려주는 정보로서 의미가 있다. In particular, the track end display portion 33 is meaningful as information indicating an end point of the corresponding track information in a case where the information track having a variable size. 예를들어 본 발명의 트랙정보는 1클러스터내에서 최대 31개 섹터까지 기록가능하지만(나머지 1섹터는 TDDS를 기록), 특정시점에서는 최대 31섹터까지 모두 트랙정보를 기록할 필요가 없을 것이므로(특히, 기록초기), 이경우에는 필요한 트랙정보를 기록한 후 트랙종료표시부로 트랙정보의 종료를 표시하므로서, 시스템의 혼동을 미연에 방지하고, 필요에 따라서는 여유영역에 유용한 또다른 관리정보를 기록할 수 있도록 한 것이다. For the track information of the present invention contains the recording up to 31 sectors in one cluster, but (the remaining one sector is recorded TDDS), the specific point in time, because it is not necessary to record the track information both to a maximum of 31 sectors (in particular , record initial), in this case hameuroseo mark the end of the track information into a track ends the display after recording the necessary track information, to avoid confusion in the system in advance, and thus records the another management information useful in the room in the required It will have to make. 따라서 디스크 관리정보로서, 트랙정보(또는 SRR 정보)는 헤더부(31)와 트랙정보 리스트부(32, 또는 SRR 엔트리 리스트)와 트랙종료표시부(33)로 구성되며 이들 정보들이 업데이트시마다 모두 일괄되어 기록된다. Therefore, as the disc management information, track information (or SRR information) is composed of a header portion 31 and the track information list part (32, or the SRR entry list) with the track end display portion 33 and is collectively all of these information are updated each time It is recorded. 관련하여, 필요에 따라서는 또다른 정보를 트랙정보(30)의 일부분으로 기록할 수 도 있을 것이다. Regard, if necessary, will be also possible to record other information as part of the information track 30. 트랙정보 리스트부(32, 또는 SRR 엔트리 리스트)에 대해 상세히 설명하면 다음과 같다. More specifically for the track information list part (32, or the SRR entry list) as follows. 트랙정보 리스트부(32, 또는 SRR 엔트리 리스트)는 복수의 엔트리들(34)을 포함하며, 각각의 엔트리는 디스크내의 하나의 트랙에 대응되며 8바이트(byte)씩 할당된다. Track information list part (32, or the SRR entry list) includes a plurality of entries (34), and each entry corresponds to a track of the disc are assigned by 8 bytes (byte). 상기 엔트리들(34)을 "트랙정보 엔트리" 또는 "SRR 엔트리"라고 명명한 다. It is one of the entries 34, entitled "track information entry" or "SRR entries". 상기 각각의 트랙정보 엔트리(34)는 해당트랙의 첫번째 상태정보(Status1, 35)필드와, 해당트랙의 시작위치를 지시하는 제1 어드레스정보(36)필드와, 첫번째 상태정보(Status1, 37)필드와, 해당트랙에 데이터가 기록된 마지막 위치를 지시하는 제2 어드레스정보(38)필드로 구성되어 진다. Each of the track information entry 34 is the first state information in the track (Status1, 35) field, a first address information 36 indicating a start position of the track field and the first state information (Status1, 37) field, and it is configured in the corresponding track to the second address information (38) field indicative of the end position of data is recorded. 예를들어, 비트63~비트60 (b63~b60)에는 상기 첫번째 상태정보(Status1, 35)필드를 할당하고, 비트59~비트32 (b59~b32)에는 상기 제1 어드레스정보(36)필드를 할당하고, 비트31~비트28 (b31~b28)에는 상기 두번째 상태정보(Status2, 37)필드를 할당하고, 비트27~비트0 (b27~b0)에는 상기 제2 어드레스정보(38)필드를 할당한다. For example, bit 63 to bit 60 (b63-b60) has the first state information (Status1, 35) assigned to the field, bit 59 to bit 32 (b59-b32) is the first address information 36 field assigned, and the bit 31 to bit 28 (b31-b28) has the second state information (Status2, 37) assigned to the field, and bit 27 to bit 0 (b27-b0) are assigned to said second address information 38 field do. 관련하여, 필요에 의해 또는 규격사항에 따라, 상기 엔트리들(34)내의 필드들(35~38)이 상이한 크기를 가지거나 또는 다른 비트 할당을 가질 수 도 있을 것이나, 본 발명은 이와같은 변형적 사용을 포함함은 자명할 것이다. Regard, would be even, or based on specification information as needed, the fields in the entries 34 (35 to 38) have a different size or may have different bit assignments, the present invention provides such a transformational including the use will be apparent. 상기 첫번째 상태정보(Status1, 35)필드와 두번째 상태정보(Status2, 37)필드는 트랙의 종류를 표시하는 트랙종류 정보와 디스크내 세션에 관련된 정보를 포함하고 있다. Wherein the first state information (Status1, 35) field and a second condition information (Status2, 37) field contains information related to the track type information and disc within the session indicating the type of the track. 따라서 상기 해당 트랙의 종류 및 세션정보는 상기 상태정보로부터 확인할 수 있고, 아울러 어드레스(36, 38)필드들로부터 해당 트랙의 위치를 확인할 수 있게 된다. Therefore, the type and the session information of the track may be obtained from the state information, it is possible as well as to check from the address (36, 38) the location field of the track. 따라서, 시스템은 상기 트랙정보를 억세스(access)함에 의해, 디스크의 특정영역이 기록가능 영역인지 또는 세션시작 영역인지 여부를 확인가능 하게 된다. Thus, the system By access (access) the track information, it is possible determine whether a particular area of ​​the disk is a recordable area or a session start region. 따라서, 상기 엔트리들(34)을 독출하면, 해당 트랙의 종류, 트랙의 시작위치, 트랙의 LRA, 및 트랙내의 세션정보를 정확하게 획득하는 것이 가능하게 된다. Therefore, when reading the entry (34), the type of the track, the track's start position, it is possible to accurately acquire the session information in the LRA of the track, and the track. 이와같이, 각 트랙정보 엔트리내에 트랙종류 정보는 물론 세션정보도 함께 기록하게 된다. Thus, it becomes a track type information, as well as session information also recorded in each track information entry. 따라서, 종래와는 달리, 별도의 세션정보를 기록하는 물리적인 영역이 없이도 호스트나 사용자가 활용할 수 있는 세션정보를 표현가능하게 되어, 디스크 사용에 더욱 효율성을 기할수 있게 된다. Therefore, unlike the prior art, without the need for a physical area for recording a separate session information is capable of expression a host or session information for use on the customer, it is possible to be more efficient to group disk. 관련하여 상기와 같이 물리적영역의 할당없이 세션정보를 기록해두는 빙식을 '가상세션(Virtual Session)' 또는 '논리적세션정보(Session Logical Information)'라고도 한다. Regard to the bingsik to record the session information without any allocation of the physical area as mentioned above also known as a "virtual session (Virtual Session) 'or' logical session information (Session Logical Information)". 도4는 본 발명의 제1 실시예에 따른, 1회 기록가능한 광디스크의 트랙정보내의 트랙정보 엔트리(34)의 구조를 예를들어 도시한 것이다. Figure 4 illustrates, for a structure of a track information entry 34 within the track information of the optical disc of write once type, according to a first embodiment of the present invention. 도4에 의하면, 디스크상에는 복수의 트랙이 존재하고 (트랙 #1~트랙 #8), 각각의 트랙은 전술한 정의에 따라 트랙종류를 알려주는 첫번째 상태정보(Status1, 35)필드에 의해 구분되고, 또한 해당 트랙이 세션의 시작트랙인지 유무를 표시하는 정보를 별도의 두번째 상태정보(Status2, 37)필드내에 기록해둔다. Referring to Figure 4, a plurality of tracks on the disk is present and (the track # 1 to track # 8), each track is divided by the first status information indicating the track type (Status1, 35) field according to the foregoing definition , and whether the track is a track in the session start haedunda record information indicating the presence or absence in a separate second state information (Status2, 37) field. 즉, 예를들어, 트랙상태정보(Status1, 35)로서 오픈트랙은 "0000b"를, 인터미디에이터트랙은 "0001b"를, 클로즈트랙은 "0010b"로 서로 구분할 수 있게 된다. That is, for example, as the track status information (Status1, 35) open track is "0000b", the inter-mediator track is "0001b", it closed track is able to distinguish between a "0010b". 또한 세션상태정보(Status2, 37)는 각 세션의 시작트랙에 해당하는 트랙(session start track)은 "1000b"로, 그외 트랙(non-session start track)은 "0000b"로 구분하였다. Also the session state information (Status2, 37) has a track (session start track) is to "1000b", other tracks (non-session start track) corresponding to the respective session start tracks were classified into "0000b". 따라서 도4에서, 세션 #1,#2,#3은 각각 클로즈트랙으로부터 시작하여 클로즈트랙으로 끝나는 클로즈세션(close session)으로 정의될 것이고, 세션 #4는 오픈트랙(트랙#7)으로 시작하여 아직 세션이 클로즈되지 않은 오픈세션(open session)으로 정의할 수 있다. Thus, in Figure 4, the session # 1, # 2 and # 3 will be defined as the closed sessions (close session) ending with a closed track, starting from each of the closed track, Session # 4 is started with the open track (Track # 7) Open session has not yet been closed session may be defined as (open session). 상기 정의에 따를때는 클로즈세션은 더이상 기록을 할 수 없 고 해당 세션을 재생만 가능하며, 오픈세션은 기록가능한 세션이 된다. When you follow the above definition closed session and only playing the session and can not be any more records, open sessions are recordable session. 만약 특정 오픈세션에 대해 클로즈하고자 하는 클로즈세션 명령이 내려지면, 오픈세션내에 존재하는 오픈트랙은 모두 클로즈트랙으로 변경한 후, 상기 트랙종류 정보를 클로즈트랙으로 변경하게 된다. If it is ground down to a close session command to close for a particular open session, all the open tracks existing within the open sessions are changed to close and then the track, changing the track type information in closed track. 예를들어, 세션#1의 트랙#2는 최초 오픈트랙이었으나, 클로즈명령(클로즈트랙 또는 클로즈세션 명령)에 의해 트랙내의 기록가능한 영역을 "zero padding(또는 더미데이터)"한 후, 클로즈트랙으로 변경한 경우이며, 결국 세션#1은 클로즈트랙으로 종료되는 클로즈세션으로 변경된 경우에 해당된다. For the example, yieoteuna track # 2 is first open track of a session # 1, the close instruction after the recordable area in the track by the (closed track or the close session command), a "zero padding (or dummy data)", closed track and if it is changed, and eventually the case if session # 1 is changed to a closed session that ends with closed tracks. 관련하여, 특정 시스템의 경우에는 상기의 경우 "zero padding"없이 트랙종류정보(Status1)만을 클로즈트랙에 해당하는 "0010b"로 변경하는 것도 가능하다. Regard, it is possible, for certain systems, for the case of the change to the "zero padding" "0010b" to the track type information only (Status1) a closed track without it. 따라서, 도4의 실시예에 의하면, 트랙 #1~트랙 #6은 모두 클로즈트랙이므로 "Status1 = 0010b"가 될것이나, 이중 트랙#1,#3,#4는 각각 세션#1,#2,#3의 시작트랙으로서 "Status2 = 1000b"가 될 것이고, 트랙#2,#4,#5,는 각 세션내의 시작트랙이 아닌 트랙으로서 "Status2=0000b가 될것이다. 또한 트랙#7은 오픈트랙으로 "Status1 = 0000b"가 되면서, 아울러 세션#4의 시작트랙이므로 "Status2 = 1000b"가 되며, 트랙#8은 인터미디에이터트랙으로 "Status1 = 0001b"가 되면서, 세션#4의 시작트랙이 아니므로 "Status2 = 0000b"가 될 것이고, 이경우 세션#4는 세션이 클로즈되지 않은 오픈세션으로 정의되어 진다. Therefore, even according to the embodiment 4, the track # 1 to track # 6 is or will be both so-closed track "Status1 = 0010b", a dual track # 1, # 3, # 4, # 1, each of the session # 2, as the starting track # 3 will be a "Status2 = 1000b", the track # 2, # 4, # 5, is will be the "Status2 = 0000b as a track, but not at the beginning of tracks in each session. in addition, the track # 7 is an open track to "Status1 = 0000b" is, as well, so start track of session # 4, and the "Status2 = 1000b", track # 8, while the "Status1 = 0001b" in the inter-mediator track, not the start track of session # 4 as " It will be Status2 = 0000b ", in this case, session # 4 is defined as the open session that the session is not closed. 도4의 실시예에서, 상기 두번째 상태정보(Status2, 37)필드에 기록된 세션상태정보는 1비트로 지정하는 것도 가능하다. In the embodiment of Figure 4, the session status information recorded in the second state information (Status2, 37) field it is possible to specify one bit. 예를들어, 비트가 '1b'이면 세션의 시작트랙을 의미하고, 비트가 '0b'이면 세션의 시작트랙이 아님을 의미한다. For example, if the bit is '1b' means the start track of a session, and if the bit is '0b' means not the start track of a session. 상기 1 비트는 두번째 상태정보(Status2, 37)필드내의 어느 비트를 할당하는 것이 가능하다. The first bit it is possible to assign one bit in the field, the second status information (Status2, 37). 유사하게 첫번째 상태정보(Status1, 35)필드내의 2개의 인접하는 비트를 힐당하여 트랙상태정보를 지시하는 것도 가능할 것이다. Similarly, the first state information (Status1, 35) by assigning the heels of two adjacent bits in the field may be possible to indicate the track status information. 도5는 본 발명의 제2 실시예에 따른, 1회 기록가능한 광디스크의 트랙정보내의 트랙정보 엔트리(34)의 구조를 예를들어 도시한 것이다. 5 is a diagram for a structure of a track information entry 34 within the track information of the optical disc of write once type, according to a second embodiment of the present invention. 관련하여, 상기 도4의 제1 실시예는 각 세션의 시작트랙만을 구분하였으나, 도5의 제2 실시예는 세션의 시작트랙(session start track) 뿐만 아니라, 종료트랙(session end track), 시작이자 종료트랙(one track-one session), 시작도 종료도 아닌 중간트랙(non-session start/end track) 으로 다양하게 구별하는 방법이다. With respect to the diagram of a first embodiment of the fourth example, but nine minutes only start track of each session, the second embodiment of Figure 5 as well as the start track (session start track) of the session end tracks (session end track), starting and an exit track method for variously distinguishing the intermediate tracks (non-session start / end track) nor end (one track-one session), starts. 제2실시예에서 알수 있듯이, 본 발명의 트랙정보내 기록되는 세션정보는 다양한 방법에 의해 정의하는 것이 가능하며, 아울러 규격화된 정보로서 필요할 경우에는 더욱 세분화하여 구분하는 것도 가능할 것이다. As you can see in the second embodiment, the recording track information, session information of the present invention will be possible to it is possible to define by a variety of methods, as well as separate them is further subdivided if needed as standardized information. 도5에 의한 트랙정보 엔트리(34)의 구조 및 사용은 전술한 도4의 경우와 비교시 두번째 상태정보(Status2, 37)필드를 제외하고는 동일하다. Fig structure and use of the track information entry 34 by 5 is the same except in the case of FIG. 4 as compared to the second state information (Status2, 37) field. 제2 실시예에서 상기 두번째 상태정보(Status2, 37)필드에는, 해당 트랙의 서로다른 4가지 상태를 나타내는 세션상태정보를 기록하게 된다. The status information has the second (Status2, 37) field in the second embodiment, thereby recording the session state information which indicates the four different states of the track. 따라서, 상기 두번째 상태정보(Status2, 37)필드의 구조 및 사용에 대해 설명하고자 하며, 도4와 동일부분에 대해서는 설명을 생략하고자 한다. Thus, it is to explain the structure and use of the second status information (Status2, 37) field, and to omit the explanation of the same parts as in Fig. 도5에 의하면, 트랙 #1,#4,#7은 각각 세션 #1,#3,#4의 시작트랙이므로 세션상태정보는 "Status2 = 1000b"가 된다. According to Fig. 5, it is the track # 1, # 4 and # 7 are respectively the session # 1, # 3, track # 4, so starting the session status information is "Status2 = 1000b". 트랙 #2,#6은 각각 세션 #1,#3의 종료트랙 으로서 세션상태정보는 "Status2 = 1001b"가 된다. Tracks # 2 and # 6 are respectively the session # 1 and session state information as the end of the track # 3 is "Status2 = 1001b". 트랙 #3은 세션 #2의 시작트랙이자 종료트랙이며, 이는 하나의 트랙으로 하나의 세션을 의미하는 것으로서 세션상태정보는 "Status2 = 0001b"가 될것이고, 트랙 #5,#8은 각각 세션 #3,#4의 중간트랙(시작트랙 또는 종료트랙이 아닌경우)으로 세션상태정보는 "Status2 = 0000b"가 될것이다. Track # 3 is the start track and end track of the session # 2, which is as meaning a session as a track the session state information, will be a "Status2 = 0001b", the track # 5 and # 8 are each session # 3, the middle track # 4 (if it is not the start track or end track) into the session status information will be the "Status2 = 0000b". 따라서, 각 세션내의 모든 트랙이 클로즈트랙인 경우를 클로즈세션(세션#1,#2,#3)이라 정의 가능하고, 각 세션내에 적어도 하나 이상의 오픈트랙을 구비한 경우를 오픈세션(세션#4)으로 정의하는 것이 가능하다. Therefore, the close session if all tracks are closed tracks in each session (the session # 1, # 2, # 3) to open a session when the Definition possible, at least comprising at least one open track in each session (Session # 4 ) it can be defined. 도5의 실시예에서, 두번째 상태정보(Status2, 37)필드내에 기록되는 세션상태정보는 상이한 비트를 할당하여 표시하는 것도 가능하며, 유사하게 첫번째 상태정보(Status1, 35)필드내의 2개의 인접하는 비트를 힐당하여 트랙상태정보를 지시하는 것도 가능할 것이다. In the embodiment of Figure 5, the second state information (Status2, 37) can be session status information recorded in the fields is displayed by assigning a different bit, and similarly to the first state information (Status1, 35) of two adjacent in the field, heel by assigning the bits may be possible to indicate the track status information. 도6은 본 발명의 제3 실시예에 따른, 1회 기록가능한 광디스크의 트랙정보내의 트랙정보 엔트리(34)의 구조를 예를들어 도시한 것이다. Figure 6 shows the structure of a track information entry 34 within the track information of the optical disc of write once type, according to a third embodiment of the present invention, for example shown. 도6에 의한 트랙정보 엔트리(34)의 구조 및 사용은 전술한 도4의 경우와 비교시, 첫번째 상태정보(Status1, 35)필드 및 두번째 상태정보(Status2, 37)필드를 제외하고는 동일하다. Structure and use of the track information entry 34 according to Figure 6 and is the same except when compared to the case of FIG. 4, the first status information (Status1, 35) field, and second status information (Status2, 37) field . 즉, 트랙정보 엔트리(34)내의 다른 필드(36, 38)들은 도4의 경우와 동일하다. In other words, the other fields in the track information entry 34, 36 and 38 are the same as those in Fig. 도6의 실시예는, 상기 첫번째 상태정보(Status1, 35)필드는 향후 활용을 위해 리저브(reserved) 영역으로 남겨두고, 두번째 상태정보(Status2, 37)필드에는 세션상태정보를 기록한다. The embodiment of Figure 6, the first status information (Status1, 35) fields are left in reserve (reserved) area for future utilization, and writes a second status information (Status2, 37), the session state information fields. 상기 세션상태정보는 1비트로 지정하는 것이 가능하며, 예를들어, 비트가 '1b'이면 세션의 시작트랙을 의미하고, 비트가 '0b'이면 세션의 시작트랙이 아님을 의미한다. The session status information can be specified by one bit, and for example, if the bit is '1b' means the start track of a session, and if the bit is '0b' means not the start track of a session. 또한 상기 1비트는 두번째 상태정보(Status2, 37)필드내의 어느 비트를 할당하는 것이 가능하며, 예를들어, 두번째 상태정보(Status2, 37)필드내의 비트31(b31)을 세션상태정보로 활용할 수도 있다. In addition, the first bit is the second state information (Status2, 37) it is possible to allocate some bits in the field, for example, the second state information (Status2, 37) also take advantage of the bit 31 (b31) in the field to the session status information, have. 이경우 사용되지 않는 두번째 상태정보(Status2, 37)필드내의 다른 비트들(b30, b29, b28)은 리저브(reserved) 영역으로 남겨두게 된다. In this case, the second state information that is not used (Status2, 37) other bits in the fields (b30, b29, b28) is to leave a reserve (reserved) area. 또다른 변형적 사용으로, 도6의 두번째 상태정보(Status2, 37)필드내에 상기 세션상태정보 및 트랙상태정보를 모두 기록하고, 상기 첫번째 상태정보(Status1, 35)필드는 향후 활용을 위해 리저브(reserved) 영역으로 남겨둘 수도 있다. In addition to other modifications and variations, and the second condition information (Status2, 37) the session status information, and recording both the track status information, and wherein the first state information (Status1, 35) a field in the field reserved for future use of the Fig. 6 ( It may be left in reserved) area. 예를들어, 상기 두번째 상태정보(Status2, 37)필드내의 첫번째 비트(b31)을 세션상태정보로 활용하고, 나머지 비트들(b30, b29, b28)은 도4에서 전술한 트랙상태정보로 활용하는 것이 가능하다. For example, the advantage of the first bit (b31) in the second state information (Status2, 37) field in the session state information, the remaining bits (b30, b29, b28) is to serve as a track status information described above in FIG. 4 it is possible. 도7은 본 발명의 실시예에 따른 상기 도3~도6의 1회 기록가능한 디스크의 트랙정보를 업데이트하는 방법를 도시한 것이다. 7 is bangbeopreul updating the track information of the write-once disk 1 in FIG. 3 to 6 according to an embodiment of the present invention shows. 1회 기록가능한 광디스크는 '1회기록성'이라는 특수한 특징을 가지므로, 디스크내의 특정영역의 기록상태를 알려주는 디스크 상태정보가 항상 필요하다. Write once optical disc, because of the special feature of "once archival capabilities", the disc status information indicating the recorded status of a specific area of ​​the disc is always necessary. 따라서, '트랙정보를 업데이트' 함은, 시스템이나 사용자가, 디스크내의 기록에 따른 상태에 변화가 있을때마다 트랙정보의 업데이트를 통해 트랙정보를 활용가능하게 됨을 의미한다. Thus, also, updating the track information ", means that the system or the user, to enable use of the track information by updating the track information each time when a change in state of the recording of the disc. 따라서, 새로운 트랙이 생성되거나, 기존의 트랙이 클로즈(close)될때는 트랙정보가 새로 생성되는 시기이므로 업데이트함이 필요하다. Therefore, a new track is created or, since the existing track close (close) when the time which the track information is newly generated is necessary also updated. 또한 디스크가 이젝트 (eject)되거나, 전원을 오프(off)할때에도 디스크의 사용을 일시중지하는 경우로서 최종적인 상태의 트랙정보를 업데이트해 두어야 차후 디스크의 사용시 기록상태를 정확히 파악할 수 있게 되므로, 이경우도 업데이트가 필요하다. In addition, because or the disk is ejected (eject), even when off (off) the power able to pinpoint when using the recorded state of the future must update the track information of a final state as if the suspended use of the disk, the disk, in this case also it needs to be updated. 도7은 본 발명의 트랙정보를 업데이트하는 방법에 의하면, 이전단계의 트랙정보와 현재 업데이트할 트랙정보를 포함하여 누적적으로 기록하되, 트랙정보 리스트를 특정순서로 정렬(sorting)하여 기록하는 방식이다. Figure 7 according to the method of updating the track information of the present invention, the track information of the previous stage and including the track information to the current update, but recorded cumulatively, method of recording and sorting (sorting) the track information list in a specific order, to be. 이를 구체적으로 설명하면, (n+1)번째 업데이트되는 트랙정보를 기록하기 위해서는, 우선 n번째 기록된 트랙정보를 확인하고, 상기 n번째 기록된 트랙정보와 현재 업데이트할 (n+1)번째 트랙정보를 하나의 트랙정보 리스트로 보고, 특정순서로 정렬하여 기록하게 된다. If it specifically, (n + 1) th to record that is updated track information, first, the n-th check the recording track information, and the n-th recording track information, and to the current update (n + 1) th track reporting the information to a track information list is recorded in alignment in a specific order. 마찬가지로 (n+2)번째 업데이트되는 트랙정보를 기록하기 위해서는 우선 (n+1)번째 기록된 트랙정보를 확인하고, 상기 (n+1)번째 기록된 트랙정보와 현재 업데이트할 (n+2)번째 트랙정보를 하나의 트랙정보 리스트로 보고, 특정순서로 정렬하여 기록하게 된다. Likewise, (n + 2) to record the track information is first updated first (n + 1) th to confirm the recording track information, and the (n + 1) th recording track information, and to the current update (n + 2) It reported the first track information in a track information list is recorded in alignment in a specific order. 관련하여 정렬순서는 예를들어, 트랙종류를 표시하는 첫번째 상태정보(Status1, 35)를 우선 기준으로 하고, 동일 트랙종류내에서는 트랙의 첫번째 어드레스정보(Start PSN)필드를 기준으로 하게 된다. Related to the sort order, for example, the first state information (Status1, 35) indicating the track type to the first criteria, is in the same track the type based on the first address information (Start PSN) of the track field. 그러나, 또다른 정렬기준으로 정렬할 수 있음은 자명하다. However, it is apparent that the addition can be sorted in different sorting criteria. 상기 기준에 따른 트랙정보 리스트의 정렬을 본 발명에 적용하여, (n+2)번째 업데이트시의 정렬상태를 보면 다음과 같다. By applying the alignment of the track information list according to the criteria in the present invention, (n + 2) looking at the alignment state at the second update it follows. 즉, 트랙종류 정보로서 "0000b"를 가지는 오픈트랙이 먼저 정렬되고, 다음은 트랙종류 정보가 "0001b"를 가지는 하나뿐 인 인터미디에이터트랙이 정렬되고, 다음은 트랙종류정보가 "0010b"를 가지는 일반 클로즈트랙이 정렬되게 된다. That is, the alignment is an open track has a "0000b" First, as the track type information, the next one as the inter-mediator tracks, the track type information with "0001b" is sorted, the next track type information with "0010b" the general closed track is aligned. 또한 동일 트랙종류내에서는 트랙의 첫번째 어드레스정보가 가장 앞선 것이 우선하여 정렬된다. It is also aligned in preference to the most advanced first address information of the track, the same track type. 그러나 정렬(sorting)과 관련하여 트랙종류 정보로서 어떤 비트배열을 할당하느냐 또는 정렬(sorting)의 기준을 무엇으로 하느냐는 일종의 선택의 문제로서 시스템이나 설계자에 따라 다양한 방식으로 적용이 가능할 것이다. However, as the alignment with respect to the track type information (sorting) as a matter of some sort of selection do the standards do or sorting (sorting) assign any bits arranged in what will be possible to apply a variety of ways according to the system or designer. 본 발명과 같이, 이전의 트랙정보를 포함하여 정렬(sorting)하는, 트랙정보 업데이트 방식의 장점은, 디스크내에 존재하는 모든 트랙이 종류별로 정렬되어 있어 원하는 트랙종류에 관한 정보를 쉽게 취득할 수 있게 되고, 마지막에 업데이트된 최신의 트랙정보만을 참조하면 이전단계의 모든 트랙정보를 한번에 확인가능하게 되어 억세스(access)타임을 줄일수 있는 점에 있다. As in the present invention, it allows the advantages of sorting (sorting), including the previous track information, a track information update method, it is all tracks existing within the disc are sorted by type can easily obtain information about the desired track type and, it is to the point that you can see all the possible track information from the previous step at a time to reduce the access (access) the time when you see only the latest track information updated last. 도8은 전술한 본 발명의 디스크 상태정보를 기록하고 관리 및/또는 업데이트하는 방법을 구현하는 기록재생장치를 도시한 것이다. 8 is a recording disk state information of the present invention described above shows a recording and reproducing apparatus to implement a method for managing and / or updating. 단, 상기 본 발명의 방법들 및 디스크 구조들은 또다른 시스템 및 장치를 통해서도 구현가능 할 것이다. However, the methods and disc structures of the present invention will be implementable through the other systems and devices. 도8에 도시된 바와 같이, 본 발명의 기록재생장치는, BD-WO와 같은 1회 기록가능한 광디스크에 기록재생을 수행하는 기록재생부(10)와, 이를 제어하는 제어부(20)로 구성된다. 8, the recording and reproducing apparatus of the present invention is configured as a one-time recording and playback section 10, a control unit 20 to control it to perform recording and playback on a recordable optical disc such as a BD-WO . 제어부(20)는 기록재생부(10)로 특정영역에의 기록 또는 재생 명령을 내리고, 기록재생부는 제어부의 명령에 따라 특정영역에의 기록재생을 수행하게 된다. The control unit 20 makes a recording or reproducing command for a specific area to the recording and playback section 10, and performs the recording and reproduction of a specific area according to the command of the recording and playback control unit. 기록재생부(10)는 구체적으로는, 외부와 통신을 수행하는 인터페이스부(12)와, 광디스크에 데이터를 직접적으로 기록하거나 재생하는 픽업부(11)와, 픽업 부로터 재생신호를 수신하여 원하는 신호값으로 복원해내거나, 기록될 신호를 광디스크에 기록되는 신호로 변조(modulation)하여 전달하는 데이터-프로세서(13)와, 광디스크로부터 정확히 신호를 독출해내거나, 광디스크에 신호를 정확히 기록하기위해 픽업부(11)를 제어하는 서보부(14)와, 관리정보를 포함한 여러정보 및 데이터를 일시 저장하는 메모리(15)와, 상기 기록재생부내의 구성요소들의 제어를 담당하는 마이컴(16)으로 구성되어 있다. Recording and reproducing unit 10 Specifically, the received desired for the pick-up unit 11, a pickup rotor reproduction signal for directly recording or reproducing of data to the interface section 12, an optical disc for performing external communication with naegeona to restore the signal value, the data transmission by modulating (modulation) signals to be recorded into a signal to be recorded on the optical disc - to the processor 13, naegeona to read out the correct signal from the optical disc, the pickup to accurately record the signal onto the optical disc It consists of a memory 15 and a microcomputer 16 responsible for control of the components of the recording and reproducing portion for storing various information and data including the servo unit 14, the management information to control the unit 11 temporarily It is. 상기 기록재생장치내의 모든 구성요소들은 상호 유기적으로 결합되어 있다. All components in the recording and reproducing apparatus are coupled to each other organically. 본 발명에 의한 광디스크의 기록재생과정을 상세히 설명하면, 우선 광디스크가 기록재생장치내로 로딩되면, 해당 광디스크내의 기설정된 관리영역내에 기록되어진 최신의 디스크 트랙정보를 독출하여 기록재생부내의 메모리(15)에 일시 저장한다. Referring to the recording and reproducing process of the optical disc according to the present invention in detail, first, when the optical disc is loaded into the recording and reproducing apparatus, reads the latest disc track information been recorded in a predetermined management area in the optical disk memory 15 of the portion reproducing Save the date. 상기 마이컴(16)은 트랙정보 및 또다른 관리정보의 기록 및 업데이트를 제어한다. The microcomputer 16 controls the recording and updating of the track information and other management information. 아울러 상기 디스크 트랙정보내에는 최신의 디스크 사용상태가 기록되어 있는 바, 특히 특정트랙의 시작 어드레스정보와 데이터가 기록된 마지막 어드레스 정보(LRA) 및 디스크내 특정구간의 세션정보를 독출하여, 상기 독출된 정보로부터 디스크 특정영역의 기록 또는 미기록상태 및 세션종료여부를 확인가능하게 되어, 이를 광디스크의 기록재생시 활용되게 된다. In addition to read the start address information and data, the session information for a specific section of the recording end address information (LRA) and a disk of the disk track information is a bar, which is the latest disc usage status record, in particular a specific track in the read the information making it possible to make the recording or non-recorded state, and end-of-session if the disc specific area from a, it is to be utilized during recording and playback of the optical disc. 제어부(20)는 광디스크내의 특정영역에 기록 또는 재생을 원하는 경우 이를 기록재생명령으로 하여 기록을 원하는 특정영역의 위치정보와 함께 기록재생부(10)로 전달한다. The control unit 20 is transmitted to the recording and playback section 10, this with the location information of the specific desired recording by a recording and reproducing command area If desired, the recording or reproducing on the specific area within the optical disc. 기록재생부내의 마이컴(16)은 상기 기록명령을 수신한 후, 메모리(15)에 저장된 상기 디스크 트랙정보들로부터 제어부(20)가 기록을 원하는 광디스 크내 특정영역의 기록상태를 정확히 확인할 수 있게 되어, 이로부터 제어부가 원하는 기록재생명령을 수행하는 것이 가능하게 된다. The microcomputer 16 of the portion reproducing is able to accurately determine after receiving the write command, the memory 15 is stored in the disk, the light, the control unit 20 from the track information desired recording disk keunae the specific area recorded in the state is, the control unit from which it is possible to perform a desired recording and reproducing command. 본 발명의 1회 기록가능한 광디스크상에 관리정보를 기록하는 방법에 의하면, 물리적 결함관리가 수행되는 광디스크상에 트랙정보를 기록하는 것이 가능하고, 아울러 디스크 트랙정보내에 세션정보를 기록함에 따라, 세션정보 기록을 위해 별도의 물리적 영역을 할당하지 않으면서도 재생전용규격과의 호환성을 유지할 수 있게 된다. According to the method for recording management information on an optical disc write once according to the present invention, in accordance with It is possible to record the track information onto the optical disc which the physical defect management is performed, and as well as the recording of the session information in the disc track information, session If no allocation of an additional physical area for the information recording is possible even to maintain the compatibility with a reproduction-only standard. 나아가, 본 발명의 디스크 구조 및 정렬방법을 활용함에 따라, 효율적인 트랙정보의 업데이트가 가능해 진다. Furthermore, as the advantage of the disc structure and the sorting method of the present invention, it becomes possible to update the effective track information. 따라서, 결과적으로, 새로운 물리적 구조를 가지는 1회 기록가능한 광디스크에서도 관리정보를 효율적으로 관리하는 것이 가능하게 된다. Therefore, in the end, in an optical disc of write-once having the new physical structure, it is possible to manage the management information efficiently. 본 발명의 기술적 사상을 벗어남이 없이 다양한 변경, 또는 변형적인 사용이 가능함은 본 발명 기술분야의 당업자에게는 자명하다 할 것이고, 따라서, 본 발명의 청구범위 및 그 균등한 범위내에서의 변형적 사용은 본 발명에 속할 것임을 밝혀두고자 한다. Various changes from the invention without departing from, or variations of use are possible will also be apparent to those skilled in the art the art, therefore, modifications and variations in the appended claims and their equivalents scope of the invention the chair is intended that belong to the invention. 상기 하나 이상의 트랙에 관련된 트랙정보를 포함하되, 상기 트랙정보는 상기 하나 이상의 트랙에 일대일로 대응하는 하나 이상의 트랙 엔트리를 구비한 트랙 엔트리 리스트를 포함하며, 각각의 트랙 엔트리는 해당 트랙이 세션의 시작인지를 나타내는 세션상태정보를 갖는 세션상태필드를 포함하는 기록매체. Comprising a track information related to the one or more tracks, wherein, and the track information includes a track entry list having one or more tracks, the entry corresponding one-to-one to said at least one track, each track entry is the beginning of the corresponding track session recording medium including a session status field having a session status information indicating whether. 상기 각각의 트랙 엔트리는 해당 트랙의 시작위치를 나타내는 시작주소필드와 해당 트랙 내의 마지막 기록위치를 나타내는 마지막 기록주소필드를 포함하되, 상기 세션상태필드는 상기 시작주소필드와 상기 마지막 기록주소필드 사이에 위치하는 기록매체. Wherein each track entry comprising a last recorded address field indicating the last recorded position in the start address field and the track representing the starting position of the track, wherein the session status field between the last recording address field and the start address field location recording medium. 상기 세션상태필드는 상기 세션상태정보를 위한 1 비트를 포함하는 기록매체. Wherein the session status field is a recording medium which comprises a single bit for the session state information. 상기 트랙정보는 상기 기록매체 내 각 오픈 트랙을 지시하는 오픈 트랙 리스트 및 상기 기록매체 내 총 트랙 수를 나타내는 정보를 갖는 헤더를 포함하는 기록매체. The track information recording medium including a header having information indicating the total number of tracks within the open track list and the recording medium for instructing the respective open track in the recording medium. 상기 트랙정보는 상기 기록매체의 파이널라이즈 전까지 관리정보를 저장하는 상기 기록매체 내 임시결함관리영역에 저장되는 기록매체. The track information recording medium to be stored in the recording medium in the temporary defect management area for storing management information until finalization of the recording medium. 상기 트랙정보는 상기 하나 이상의 트랙에 일대일로 대응하는 하나 이상의 트랙 엔트리를 구비한 트랙 엔트리 리스트를 포함하며, 각각의 트랙 엔트리는 해당 트랙이 적어도 하나의 트랙으로 구성된 세션(session)의 시작인지를 나타내는 세션상태정보를 갖는 세션상태필드를 포함하는 기록매체 기록방법. The track information includes a track entry list having one or more tracks, the entry corresponding one-to-one to said at least one track, each track entry indicates whether the corresponding track is the start of the session (session) consisting of at least one track. recording medium, the recording method including a session status field having a session state information. 상기 각각의 트랙 엔트리는 해당 트랙의 시작위치를 나타내는 시작주소필드와 해당 트랙 내의 마지막 기록위치를 나타내는 마지막 기록주소필드를 포함하되, 상기 세션상태필드는 상기 시작주소필드와 상기 마지막 기록주소필드 사이에 위치하는 기록매체 기록방법. Wherein each track entry comprising a last recorded address field indicating the last recorded position in the start address field and the track representing the starting position of the track, wherein the session status field between the last recording address field and the start address field a recording medium recording method for location. 상기 트랙정보는 상기 하나 이상의 트랙에 일대일로 대응하는 하나 이상의 트랙 엔트리를 구비한 트랙 엔트리 리스트를 포함하며, 각각의 트랙 엔트리는 해당 트랙이 적어도 하나의 트랙으로 구성된 세션(session)의 시작인지를 나타내는 세션상태정보를 갖는 세션상태필드를 포함하는 기록매체 기록장치. The track information includes a track entry list having one or more tracks, the entry corresponding one-to-one to said at least one track, each track entry indicates whether the corresponding track is the start of the session (session) consisting of at least one track. a recording medium recording apparatus including a session status field having a session state information. 상기 각각의 트랙 엔트리는 해당 트랙의 시작위치를 나타내는 시작주소필드와 해당 트랙 내의 마지막 기록위치를 나타내는 마지막 기록주소필드를 포함하되, 상기 세션상태필드는 상기 시작주소필드와 상기 마지막 기록주소필드 사이에 위치하는 기록매체 기록장치. Wherein each track entry comprising a last recorded address field indicating the last recorded position in the start address field and the track representing the starting position of the track, wherein the session status field between the last recording address field and the start address field location recording medium recording apparatus. 상기 세션상태필드는 상기 세션상태정보를 위한 1 비트를 포함하는 기록매체 기록장치. Wherein the session status field is a recording medium recording apparatus comprising a single bit for the session state information. 상기 트랙정보는 상기 기록매체 내 각 오픈 트랙을 지시하는 오픈 트랙리스트 및 상기 기록매체 내 총 트랙 수를 나타내는 정보를 갖는 헤더를 포함하는 기록매체 기록장치. The track information is a recording medium recording apparatus, including a header having information indicating the total number of tracks within the open track list and the recording medium for instructing the respective open track in the recording medium. 상기 마이컴은 상기 기록매체의 파이널라이즈 전까지 관리정보를 저장하는 상기 기록매체 내 임시결함관리영역에 상기 트랙정보를 저장하도록 상기 픽업을 제어하는 기록매체 기록장치. The microcomputer is a recording medium recording apparatus for controlling the pickup to store the tracking information in the recording medium in the temporary defect management area for storing management information until finalization of the recording medium. 상기 마이컴은 상기 서보 및 신호처리부에 동작적으로 연결되어 상기 서보 및 데이터 프로세서를 제어하도록 구성된 기록매체 기록장치. The microcomputer is a recording medium recording apparatus configured operatively connected to the servo signal processing unit and to control the servo and data processor. 상기 마이컴은 상기 호스트로부터의 상기 기록/재생명령을 근거로 상기 픽업을 제어하도록 구성된 기록매체 기록장치. The microcomputer is a recording medium recording apparatus configured to control the pickup on the basis of the recording / reproducing command from the host. 상기 트랙정보는 상기 하나 이상의 트랙에 일대일로 대응하는 하나 이상의 트랙 엔트리를 구비한 트랙 엔트리 리스트를 포함하며, 각각의 트랙 엔트리는 해당 트랙이 적어도 하나의 트랙으로 구성된 세션(session)의 시작인지를 나타내는 세션상태정보를 갖는 세션상태필드를 포함하는 기록매체 재생방법. The track information includes a track entry list having one or more tracks, the entry corresponding one-to-one to said at least one track, each track entry indicates whether the corresponding track is the start of the session (session) consisting of at least one track. a recording medium reproducing method including a session status field having a session state information. 상기 각각의 트랙 엔트리는 해당 트랙의 시작위치를 나타내는 시작주소필드와 해당 트랙 내의 마지막 기록위치를 나타내는 마지막 기록주소필드를 포함하되, 상기 세션상태필드는 상기 시작주소필드와 상기 마지막 기록주소필드 사이에 위치하는 기록매체 재생방법. Wherein each track entry comprising a last recorded address field indicating the last recorded position in the start address field and the track representing the starting position of the track, wherein the session status field between the last recording address field and the start address field reproducing method for a recording medium position. 상기 트랙정보는 상기 하나 이상의 트랙에 일대일로 대응하는 하나 이상의 트랙 엔트리를 구비한 트랙 엔트리 리스트를 포함하며, 각각의 트랙 엔트리는 해당 트랙이 적어도 하나의 트랙으로 구성된 세션(session)의 시작인지를 나타내는 세션상태정보를 갖는 세션상태필드를 포함하는 기록매체 재생장치. The track information includes a track entry list having one or more tracks, the entry corresponding one-to-one to said at least one track, each track entry indicates whether the corresponding track is the start of the session (session) consisting of at least one track. a recording medium reproduction apparatus including a session status field having a session state information. 상기 각각의 트랙 엔트리는 해당 트랙의 시작위치를 나타내는 시작주소필드와 해당 트랙 내의 마지막 기록위치를 나타내는 마지막 기록주소필드를 포함하되, 상기 세션상태필드는 상기 시작주소필드와 상기 마지막 기록주소필드 사이에 위치하는 기록매체 재생장치. Wherein each track entry comprising a last recorded address field indicating the last recorded position in the start address field and the track representing the starting position of the track, wherein the session status field between the last recording address field and the start address field location recording medium reproducing apparatus. MXPA05012044A (en) * 2003-05-09 2006-02-03 Lg Electronics Inc Write once optical disc, and method and apparatus for recovering disc management information from the write once optical disc. MXPA01003953A (en) 1998-10-22 2003-03-10 Matsushita Electric Ind Co Ltd Information recording medium, and method and apparatus for managing defect thereof. MXPA05006119A (en) * 2002-12-11 2005-08-16 Lg Electronics Inc Method of managing overwrite and method of recording management information on an optical disc write once. ES2325441T3 (en) 2009-09-04 recordable optical disc once, Method and apparatus for recording management information on a recordable optical disc once.